Elisa was born Lisa Adaline Donovan in Poughkeepsie, New York, the daughter of Charlotte and Jack Donovan, who was a business executive. She later changed her first name to "Elisa" when she had to join the stage union, Actor's Equity, because there was already an actress in that union named Lisa Donovan. She grew up on Long Island where she was an accomplished gymnast, dancer and equestrian. She began studying acting at age 12. She attended The New School, in New York City, where she studied writing, literature and acting. She moved to Los Angeles in 1994 and got her first sitcom role as Tanya on Blossom. Donovan's breakthrough role was in the 1995 film Clueless as Amber, Cher's nemesis. Donovan also reprised her role in the television series of the same name. Other notable roles included the film A Night at the Roxbury, Beverly Hills, 90210 as Ginger LaMonica and playing Morgan Cavanaugh on the television sitcom Sabrina, the Teenage Witch. She also played Sharona on Disney Channel's Sonny with a Chance, and has appeared in the films Complacent, The Dog Who Saved Christmas, and its sequel The Dog Who Saved the Holidays. Donovan starred in the web series, The Lake on TheWB.com. Additionally, Donovan played Gayle, an insurance agent in the small town of Maple Grove, in the web series In Gayle We Trust on NBC.com. Donovan had a role in the film A Golden Christmas, where she played Anna, the sister of the main character and she played the lead role in "The 12 Wishes of Christmas." In 2006 she played a guest role in the NCIS episode "Dead and Unburied". She was also featured in 'N Sync's 1999 music video for "Thinking of You (I Drive Myself Crazy)" as the love interest for Joey Fatone. Donovan has been married to her husband Charlie Bigelow since October 20, 2012. They have a daughter named Scarlett Avery Bigelow (born May 8, 2012). 1994 Blossom Tanya "Puppy Love", "Dirty Rotten Scoundrel"
1995 Renegade Tina Douglas "The Ballad of D.B. Cooper"
1995 Simon Holly "Simon Gets Carl a Job"
1999 Oh Baby Jennifer Xavier "Sitting on Babies"
1999 Just Shoot Me! Amber "Jack Gets Tough"
2000 Jack & Jill Annie "A Key Exchange", "Starstruck"
2001 Spyder Games Gail Sanders "1.43"
2004 Judging Amy Shelby Crawford "Sins of the Father", "Roadhouse Blues"
2006 NCIS Rebecca Kemps "Dead and Unburied"
2008 Turbo Dates "3:10 to Puma"
2009 Sonny with a Chance Sharona "Poll'd Apart"
2014 Melissa & Joey Darcey "Catch & Release"
2014 HOARS (Home Owner Association Regency Supreme) Julia Roberts "No Mold, Parasites and Cocaine 244(b-1)"
^ "Elisa Donovan Biography (1971-)". Filmreference.com. Retrieved 2012-08-30. ^ "The WB can only be viewed in the United States". Thewb.com. Retrieved 2012-08-30. ^ "NBC Official Site". In Gayle We Trust. Retrieved 2012-08-30. ^ "NCIS: Dead and Unburied Cast List". Tv.com. 2006-10-17. Archived from the original on 2012-01-13. Retrieved 2012-08-30. 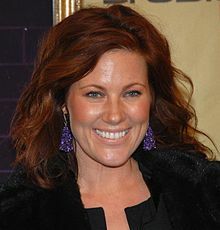 Wikimedia Commons has media related to Elisa Donovan. This page was last edited on 19 March 2019, at 10:48 (UTC).